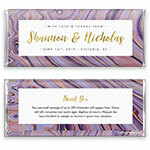 This vibrant and rich agate-inspired pattern creates a dramatic backdrop on this modern wedding chocolate bar design. 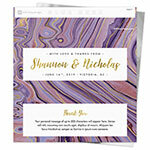 Design: A richly layered agate-inspired pattern with elegant text boxes and faux gold accents. 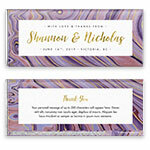 Personalization: Front names, date and message with back message.